Yes, I will have a co-signer on this loan. Depending on your situation, you may need to have someone co-sign this loan. First Name Middle Name Last Name Jr., Sr., etc. If you are not currently a member, please enter "Not a member yet". ****If you are applying for joint credit, secured credit, or if you live in a community property state (AZ, CA, ID, LA, NM, NV, TX, WA, WI, Puerto Rico), please provide a marital status. Leave blank if you do not have a home phone. *Only fill this out if you have lived at your current address for less than 3 years. To expedite the processing of this loan application, please fax two recent paystub copies to (610) 691-8624, Attention: Loan Department. If you are self-employed or retired, Federal income tax returns will be needed. **Only needed if you have been employed by your current employer for less than 2 years. **NOTE: Alimony, child support, or separate maintenance income need not be revealed if you do not choose to have it considered as a basis for this credit request. If you rent or own a home, enter the dollar amount you pay each month. **Click the + sign to add another creditor. If you will have someone co-signing for this loan, put their information in this and the next two pages. If Co-Signer is not currently a member, please enter "Not a member". ***If you are applying for joint credit, cecured credit, or if you live in a community property state (AZ, CA, ID, LA, NM, NV, TX, WA, WI, Puerto Rico), please provide a marital status. **Only supply your previous address if you have been at your current address less than 3 years. To expedite the processing of this loan application, scan two recent pay stubs to loans@beth1st.org. 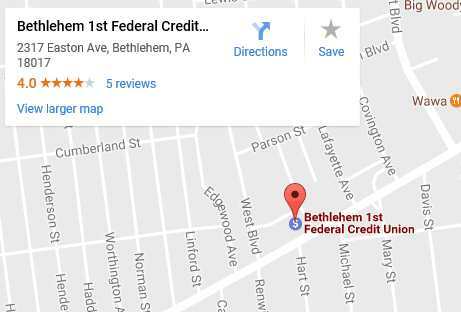 You may also fax the pay stubs to (610) 691-8624, Attention: Loan Department or drop them off at the Credit Union. If you are self-employed or retired, Federal income tax returns will be needed instead of the pay stubs. You've completed your Loan Application! You promise that everything you have stated in this application is correct to the best of your knowledge and that the above information is a complete listing of what you owe. If there are any important changes you will notify us in writing immediately. You authorize the Credit Union to obtain credit reports in connection with this application for credit and for any update, increase, renewal, extension or collection of the credit received. You understand that the Credit Union will rely on the information in this application and your credit report to make its decision. If you request, the Credit Union will tell you the name and address of any credit bureau from which it received a credit report on you. It is a crime to willfully and deliberately provide incomplete or incorrect information in this application.